A hanging bench swing is usually mounted to the joists on a porch roof with two chains. 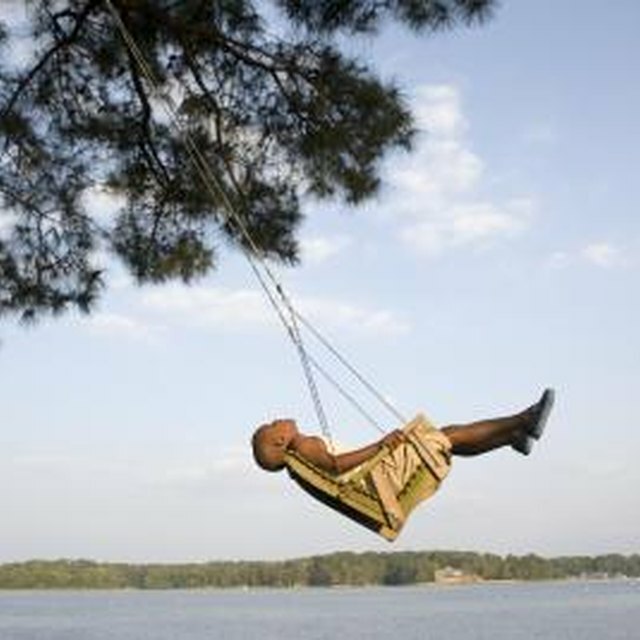 However, you can have your bench swing from a tree limb if you can locate a limb strong enough to support the weight of the swing and at least two people. Look for large oak trees and maple trees that have branches at least 6 inches in diameter and that are free of defects. This will ensure that your swing is safe to use. Wrap a string around the tree limb you plan to use for your swing. Lay the string outstretched on a table and then measure the length with a tape measure. This tells you the circumference of the branch, but it also tells you how long your strips of garden hose must be. Cut a strip of garden hose to the length of the string, and then slide the garden hose onto the end of the chain you plan to use for connecting your swing to the tree. Use a utility knife for this step. Make sure you have at least one link in the chain sticking out of the end of the hose, with the remainder of the chain sticking out of the other end of the hose. Drop the garden hose over the tree limb, and wrap it around until the single link in the chain butts up with the chain extending out of the other end of the hose. Slide a washer onto a 1-inch-long bolt, and then slide the bolt though the single chain link and the link it touches. Slide the second washer onto the end of the bolt, and then tighten everything together, using a nut and a wrench. Measure the distance between the eye bolts on the armrests of the swing, using a tape measure. Transfer the measurement to the tree limb, measuring over from the first chain you installed. Wrap the string around that location on the tree limb, cut the hose and attach the chain in the same manner as you did with the first chain. Once you're done, you should have two chains connected to the tree limb with garden hoses protecting the limb from damage due to the chains. Connect the left chain extending from the tree limb to the eye bolt on the left armrest. Place a bubble level on the seat of the swing. Position the swing so it is level, and then attach the eye bolt on the right armrest to the right chain. Once it's installed, the swing should remain level.